Celebrating a bit of bloomin’ for April and I’m loving my back garden’s bloomin’ bits. The fuchsia bloom spike of Hill Country penstemon (Penstemon triflorus) is almost drowned out by the loud red of the Martha Gonzales roses. I was attempting shots of busy native and honey bees–no joy there– but the shrubs and flowers posed beautifully and smiled winningly for the camera. The yellow Engelmann’s or Cutleaf Daisy, Engelmannia peristenia began blooming in full force during the past couple of weeks. It’s a good perennial to accompany the pond path with its sparkly daisies that flower from April to July and its year-round, attractive evergreen foliage. 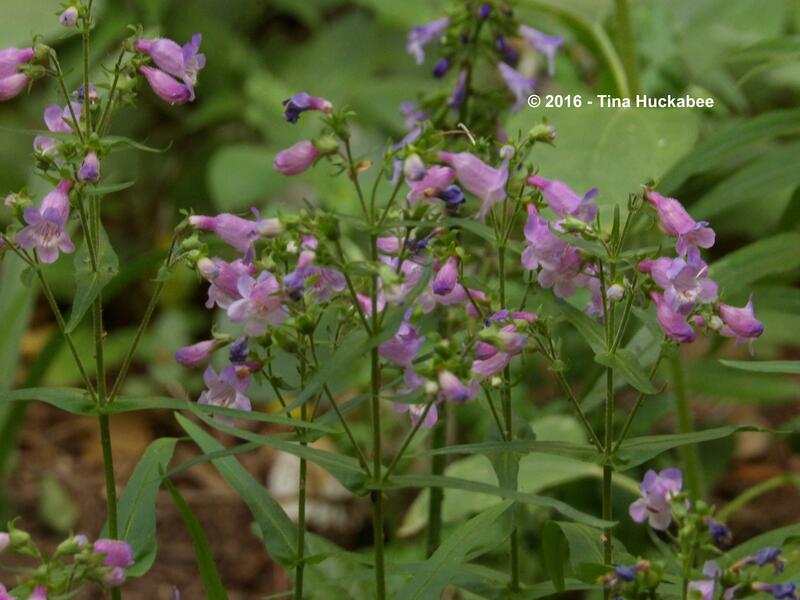 Nearby, Gulf Coast Penstemon, Penstemon tenuis are also at full-bloom speed. 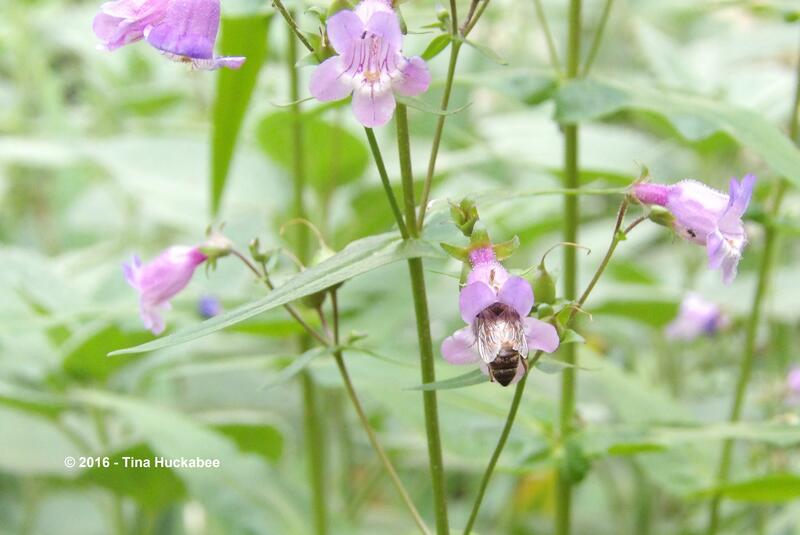 Honeybees are particularly fond of this native penstemon and I’ve also seen a variety of native bees working the blooms as well. This small area of the large back garden receives decent sunshine for much of the growing season. 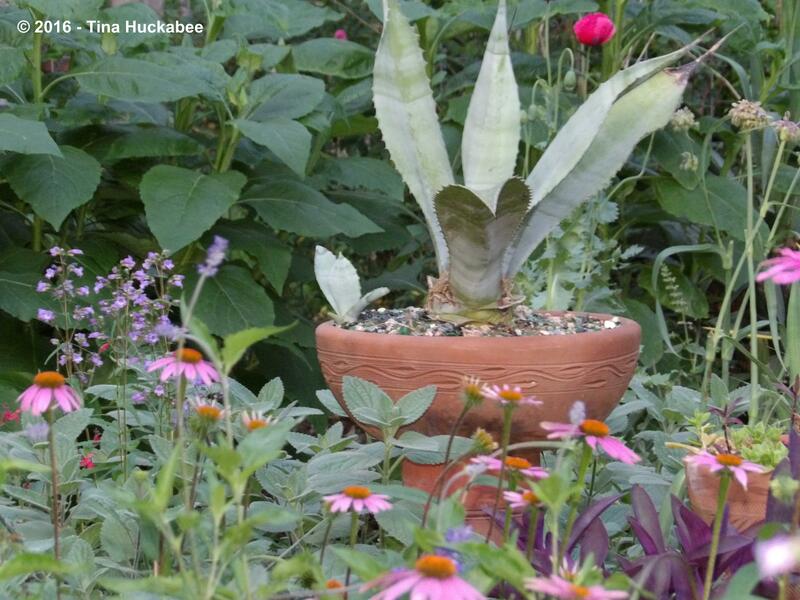 The potted American century plant, American agave oversees blooming perennials and shrubs during spring, summer and fall. 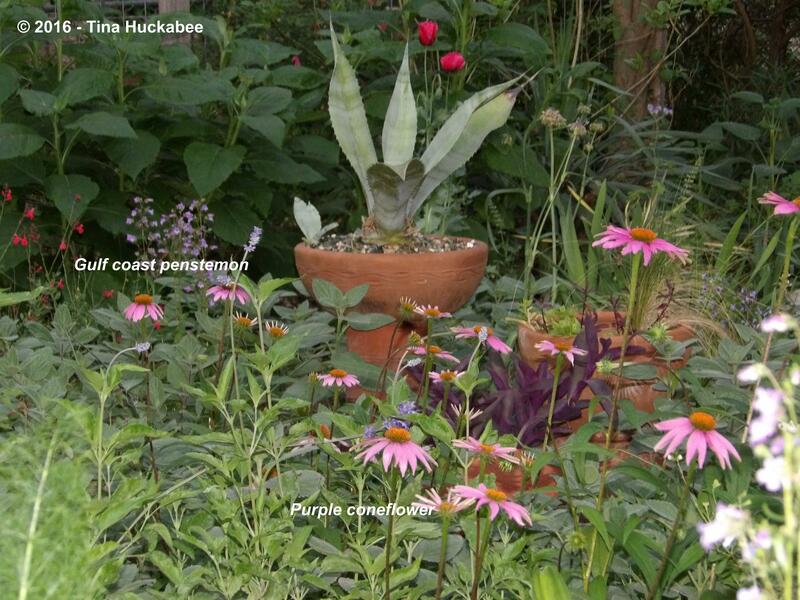 Purple coneflower (Echinacea purpurea), grey foliaged, not-yet-in-bloom Heartleaf skullcap (Scutellaria ovata), and Gulf Coast penstemon front the potted agave, while a stand of autumn blooming Frostweed (Verbesina virginica) serve as its backdrop. These unknown variety of Amaryllis came from my mother’s garden. 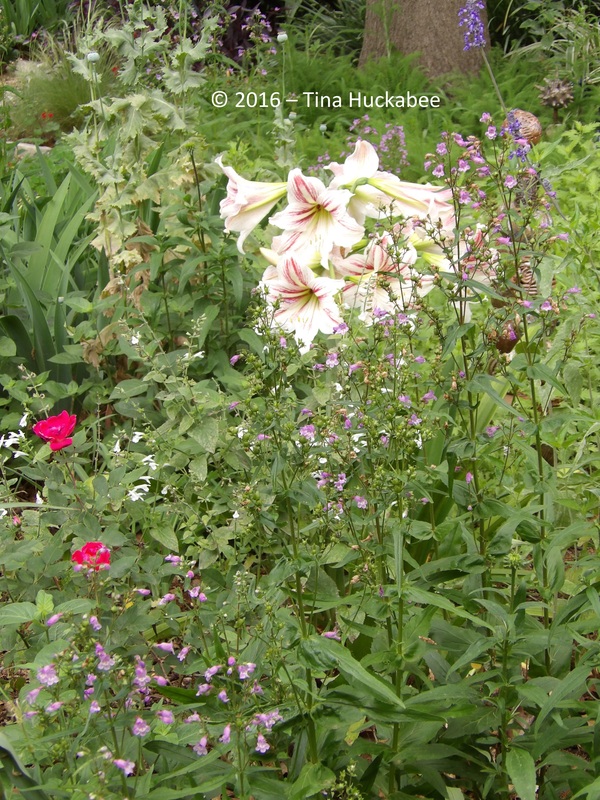 My mother’s Amaryllis grows with Gulf Coast penstemon, Knock-out roses, and poppies. The Amaryllis don’t attract pollinators (that I’ve noticed) but they evoke fond memories of my mother, who was an avid gardener and who loved flowers of all kinds. In her last garden, she mixed her amaryllis with blue-bloomed Plumbago, Plumbago auriculata and it was a stunning combination. 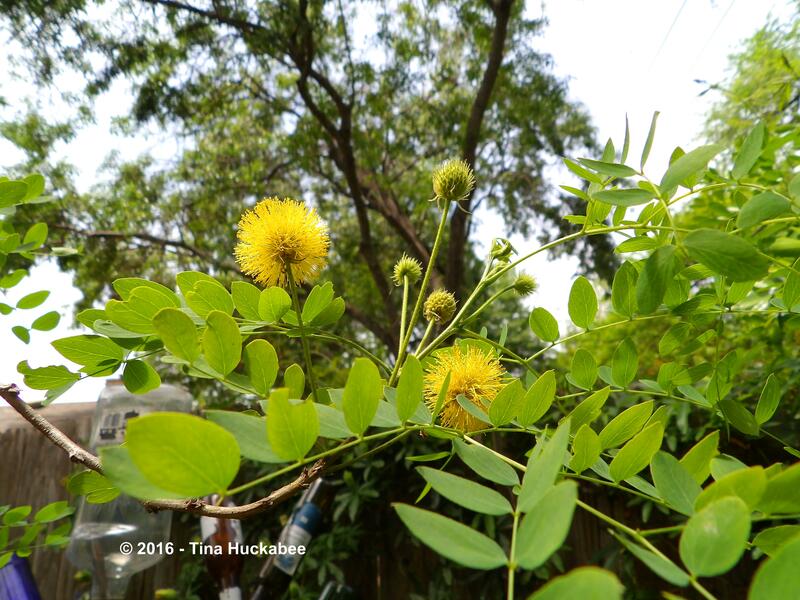 In searching for a small tree to add some height to a narrow part of my garden, I chose Goldenball leadtree, Leucaena retusa. I think it was a good decision! 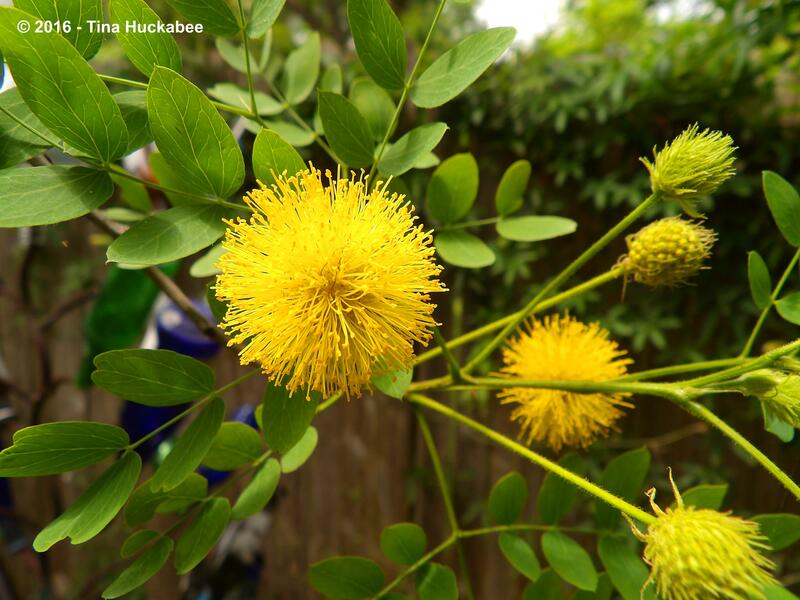 The yellow-puff balls charm the gardener while feeding bees and butterflies throughout April. Goldenball leadtree is an airy, open little tree and thrives in part-shade. 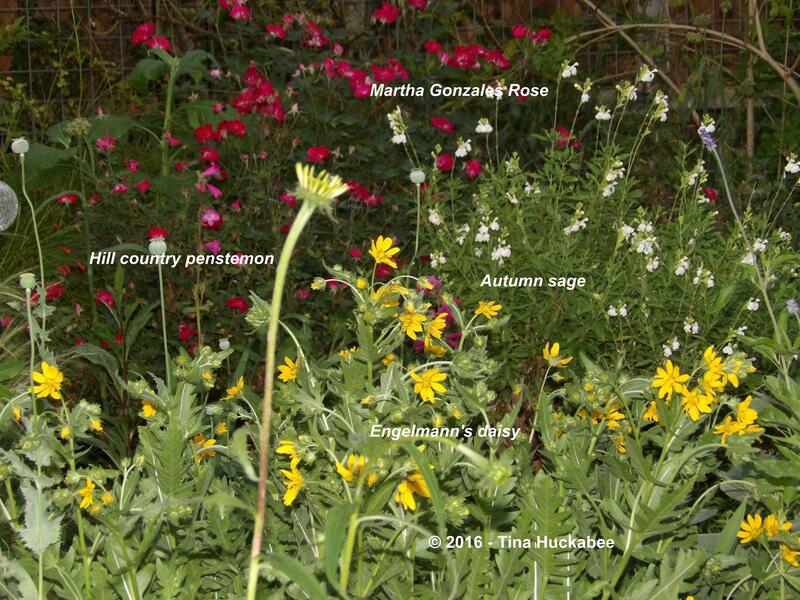 I’m pleased with my April garden and thank Carol at May Dreams Garden for hosting this monthly bloom frenzy known as Garden Bloggers’ Bloom Day. Join in and share your garden pretties, then click over to her lovely blog to see and learn about blooms from many places. 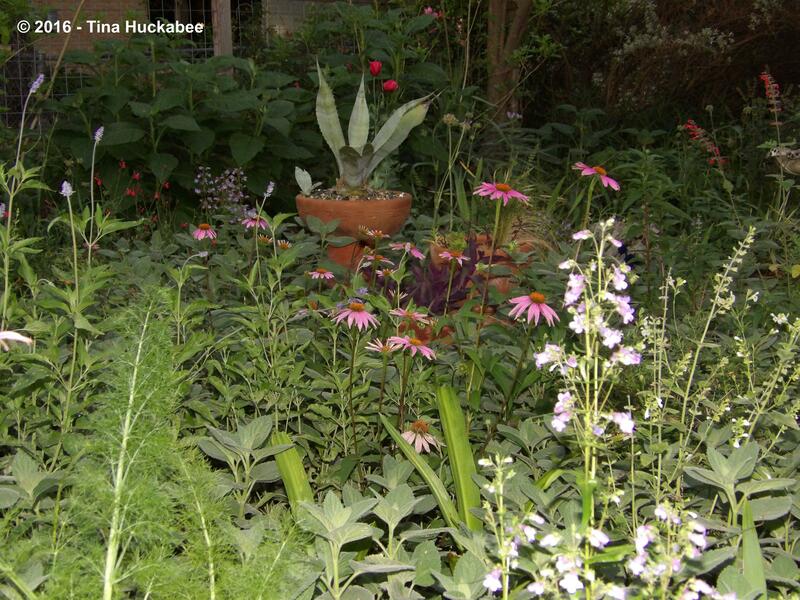 This entry was posted in Native Texas Plants, Perennial Gardening in Austin, Uncategorized and tagged Garden Bloggers' Bloom Day, GBBD by Tina. Bookmark the permalink. That Goldenball tree is fabulous! 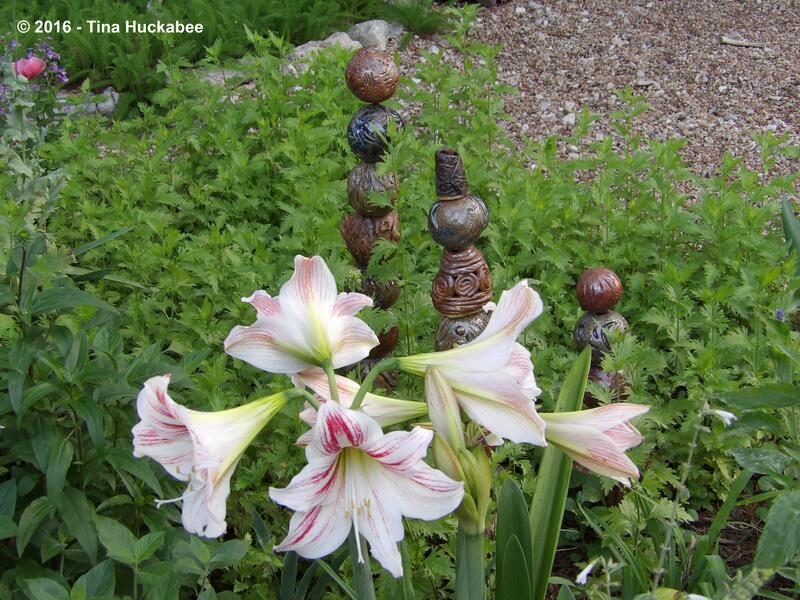 I can’t believe you can grow Amaryllis in the garden – how cool is THAT? Happy spring to you! Thanks!! The goldenball is a lovely thing, isn’t it? Even after bloom time, the seed balls are attractive and the tree is so graceful and airy–really a nice tree in a small spot. Happy spring to you, too!! Oh, thanks so much, Julie. Yes, the goldenball wouldn’t like your wet climate too much–but think of the gorgeous things you can grow that I can only drool over. We’ll enjoy one another’s gardens! Such pretty flowers in your garden! I’m fascinated with the Goldenball leadtree. So unusual—at least I’ve never seen it before. It sounds like you inherited your love of gardening from your mother. What a wonderful thing to pass along and share together. 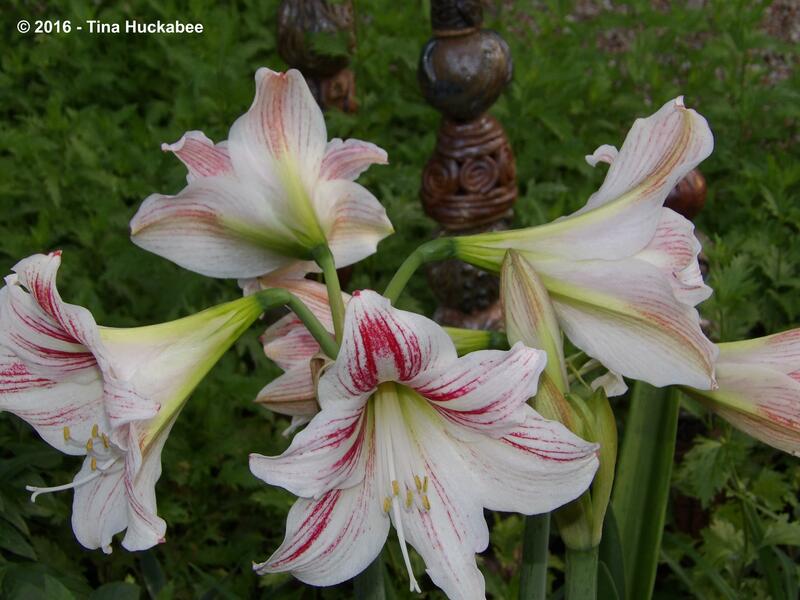 Amaryllis look splendid in your garden and it’s wonderful to have it as a memory plant. The stakes are wonderful as well. Thanks! They’ve been quite gorgeous this year and it is a lovely thing to have a plant from someone loved. Your garden is really coming along. I love your amaryllis. Mine have mostly stopped blooming. Your mother’s must be really special. Thanks–it’s been a lovely spring so far. The amaryllis are funny-they don’t bloom every year, though they have for the last few. I think they require rain and just the right time, otherwise, it’s wait until next year. I think the pollinators have lots to choose from, I hope they’re happy, Frances. It is really special to have plants from loved ones’ gardens. I always think as bout my mother when I look at the Amaryllis and some other plants of hers that I’ve planted in my garden–very special. Beautiful garden! My Coneflowers are not in bloom yet, something to look forward to. And, of course, I love that tree. Hi Jane! My cones are just revving up, some are not yet in bloom. The tree is a winner. So much beautiful bee food! Yes, I think the bees are happy! Beautiful. This is just such a pleasant time of year for flowers. 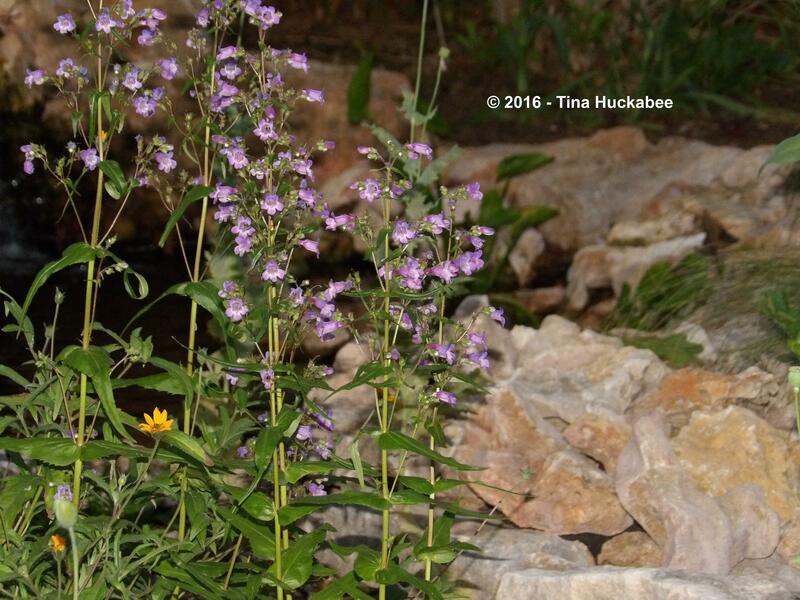 I am inspired to add some penstemon this fall. I see them growing nearby in dappled shade and they are just so pretty. The leadball is a great tree for urban spaces: offering a nice shape and size even when it stops blooming. And your mom’s Amaryllis! What a nice way to remember her. It looks pretty where you have it. Is it scented? I love all of the penstemon that I grow, so easy and pretty. You’re right that the leadtree is ideal for a small, urban garden. I’m perplexed as to why it’s not more widespread here in Austin. The Amaryllis do not have a scent-just bred for their good looks. Haha, I guess you would appreciate the great pollinator camera hunt! Last week, this huge, probably carpenter bee, but one I’m not used to seeing, buzzed through the garden. I just couldn’t get it together quickly enough to get a shot. Gah! Your April blooms are lovely and quite unlike anything we have here. It is always fascinating to see what you grow. That’s high praise indeed, coming from someone who has such a gorgeous garden! 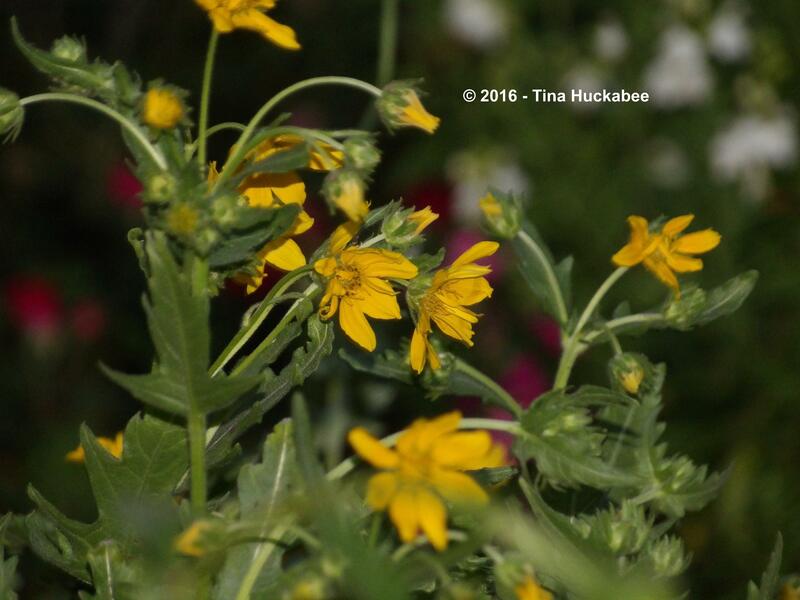 Beautiful blooms, I really enjoyed your photos. Amaryllis is gorgeous. Thank you! The Amaryllis are lovely in the garden. Thanks !You’re not alone in needing improving on providing for pollinators, so don’t feel badly! Love your Penstemon. I grow Penstemon digitalis, which has white to pink/white flowers, but I love the color on yours. Thanks, Jason. 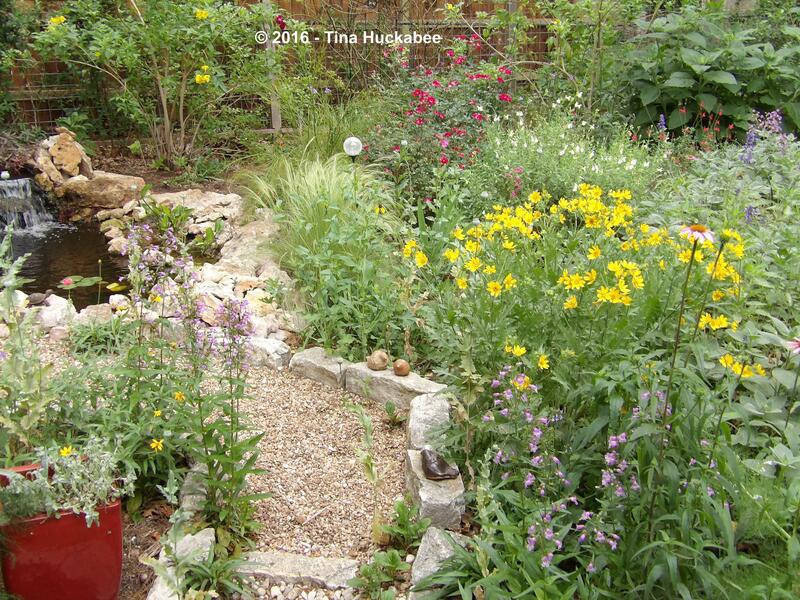 I wish the richness of the penstemon color showed true in the photos, but they’re terrific perennials.